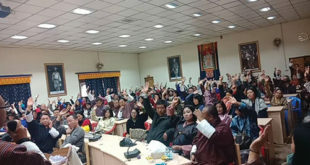 During the thematic monthly meet-the-press around the 120 days of the government on 8th March, when The Bhutanese asked the Prime Minister to give the clear numbers of pledges achieved or not Lyonchhen said that he left it to the media to judge. However, a day later, the Cabinet released a press release listing out the 25 pledges claiming that 11 had been achieved, 11 were on track and that only three were not achieved. The Bhutanese, after doing a fact check of the government’s initial claims, has now found that only two pledge were actually achieved. One was on instituting the fourth pay commission and the other was on removing the class 10 cut off point and initiating the discontinuing of exams till class six. Then there are four more pledges which are partly achieved which means that a total of 19 pledges have not been achieved despite the government’s claims, raising serious questions on their claims. The fact checked figures are much lower as it was found that the government has been outright dishonest in some claims, in other cases it passed off work of past governments as its own and on other cases it disregarded the actual language and intent of its pledges. One particularly stark case is the claim that it has achieved the pledge to convert Samrang into a vegetable farming project. Just recently, the government had claimed that it had to drop this pledge due to objections from the ECB and also after realizing that Samrang is not a meat processing unit. In fact Samrang already has a vegetable production farm nearby. It is not clear how the government ‘achieved’ a dropped and factually wrong pledge. Similarly, it was found that four other agricultural related pledges like establishing a dedicated water agency, crop insurance, addressing stray dog problems and managing waste and Sonam Gongphel projects of buying back crops were not achieved. (see page three for story). For example, a crop insurance scheme was already found to be in place and so no new insurance scheme was set up. These had been marked as either achieved or on track. However, many parents and schools were puzzled by the government’s claim as no such program was implemented. The Prime Minister during the Friday press meet said that it has been intentionally labeled as ‘achieved’ since the the cabinet approved the policy and now it is up to the people to take it up or not. 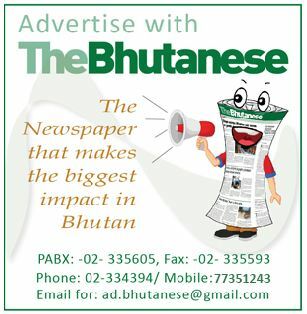 The Bhutanese found that this pledge has not been achieved as nothing has been implemented on the ground, as promised. The PM tried to equate this to doing away with Saturday classes and listed the above pledge as on track, but doing away with Saturday classes is a separate pledge and a closer look showed that the above pledge has not been achieved as there is nor framework or support. The government claimed that three Home ministry related pledges on opening offices for tshogpas, providing budget to all community Lhakhangs and initiating recruitment of foreign domestic workers were on track. 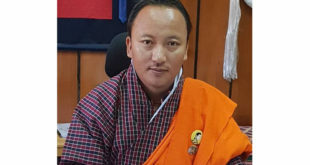 However, The Bhutanese found that not even a single Tshogpa office was established, no single community lhakhang got any funds and far from initiating the recruitment of foreign workers the immigration rules have not even been amended. 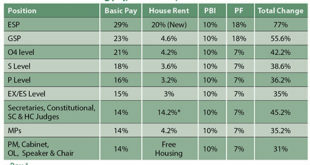 So all of the above three pledges were found to be in the not achieved category. In a clever play of words, the government claimed this pledged was fulfilled as it was made a part of the pay commission’s mandate. However, a closer look shows that while the pay commission pledge is limited to only establishing the pay commission, and can hence be considered achieved, the pledge to the RBP is a separate and specific one on reviewing the revising the pay and work conditions within 120 days which, in reality, has not been achieved. One pledge was to ‘review the national youth policy and implement a national youth action plan to address the needs of our youth,’ which the government marked as being on track or partly achieved. However, in reality though a stakeholders meeting was held youth policy is still not reviewed and the Education Secretary and the Department of Youth and Sports are yet to get back on the need for revision. The revisions, once done, has to go through the GNH screening process which is also a long way off. A national action plan for the youth is also not yet implemented. The above shows that the pledge is not even on track and hence- is not achieved. A pledge on employment was on identifying and listing the country’s skill needs, designing a program to train youth for employment and complete review of employment policies which the government marked as on track. However, none of the above are yet to happen within 120 days and instead the ministry is relying on a master plan that the previous government came up with. This means this pledge is also not achieved. In terms of services the government came up with two pledges. One was to develop professional service standards and minimal turn-around times for all public services which it says is achieved. The second on is to institute mechanisms for delivery of all public services in gewogs and thromdes through one-stop shops which it says is on track. The two pledges above are good examples of the current government making pledges that already existed under the previous government and then claiming that the the ongoing natural progression of work to be their new achievements. The governments claims of achievements in these two pledges are either existing G2C Office professional service standards and minimal turn-around times for all public services or the ongoing works on them. Already in December 2017 G2C had 135 public services of which 120 were online services and 15 were mobile services. The DNT talked of 151 services being given including 85 in the Dzongkhags. The website of G2C itself says that G2C is a public service delivery initiative under the Prime Minister’s Office with the primary objective to simplify and enhance the delivery of public services. It says the office has been institutionalized as Public Services & Grievances Redressal Division (PSGRD) under Cabinet Secretariat in the end of 2016. Similary, the eKaaSel system referenced by the government was actually already launched in December 2017. The system, as explained during its launch in 2017, is an online grievance redressal system where people can express their dissatisfaction, problems and provide feedback on public services offered in the country. It is therefore difficult to see how pre-existing and ongoing programs launched by previous governments can be counted as achievements of this government. In another example of a pre-existing pledge the DNT pledged to review the 12th plan to include revolving funds for CSOs and funds for film and documentary promotion but the government found that the revolving fund already exists. While the government met with the core coordination committee of the CSOs to discuss their challenges no specific support and funding has been promised. Given that a fund already existed and nothing more has been done the pledge remains unachieved. The Bhutanese found that four pledges that the government claimed as being achieved are actually only partly achieved or on track. One is to do with establishing a high level committee to draft the country’s long term vision but while the committee is established there has been no progress. The other is on establishing a private sector development committee to implement the private sector development recommendations of 2016. Here, while the committee has been recently set up, no work has been done on implementing the recommendations. On the pledge relating to Taxi drivers, while it has addressed some issues it is yet to address parking issues and get other agencies like Thromdes on board. In terms of establishing a tourism board and implementing the Bhutan Tourism Review, 2016 the board has been established but implementation is yet to happen. This leaves the three DNT pledges which the government itself said has not been achieved and these are cabinet ministers using electric/hybrid cars for local travel, developing Suung Joen app and removing the five percent voucher tax and giving free access to online data and free intranet. 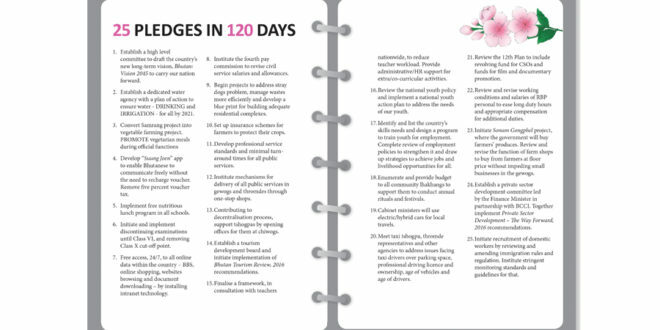 Meanwhile, the Opposition party has come out saying that only one pledge has been achieved from the entire 25 pledges (see story on page 8).